Blue Rooster was contracted by a large, multinational glass manufacturer to research, design, and develop a corporate communications portal that presented corporate news to it’s 20,000+ employees. Walking into this project, we already had a good idea of what the client liked and disliked due to a previous engagement where a company came in and did data gathering and wireframes, but missed the mark on communication, and the client eventually terminated the contract with them. However, this left Blue Rooster with previous research findings, and a set of initial wireframes, with which to work off of. With this in our toolbox, a user experience researcher, project manager, solutions architect, and myself flew out to New York to conduct further research on what the users wanted from this portal. We spoke with representatives from multiple areas of the company. These representatives included factory workers, international employees, the internal corporate communications team, and the IT team. 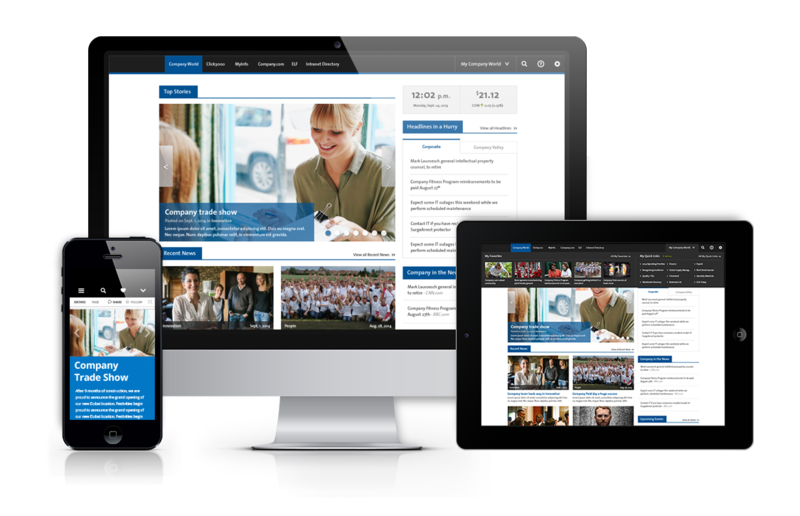 In essence, the team wanted an easy way to create and consume multimedia content on their SharePoint 2013 platform. Research Assistant: Aided the UX researcher in the conducting of user interviews. Wireframes: Created wireframes that displayed visually what we heard from the client. This allowed us to open the dialogue as to whether or not we hit the mark with our research. My wireframes are inspired by sketches, whiteboard sessions, and communication with other designers, researchers, project managers, the client, and leadership. Visual Design: After receiving buyoff from the client that everything was looking good, it was time to translate the wireframes into visual designs. Like all projects, there is the need to move elements on the page to ensure that the user experience is how it needs to be to accomplish the business goals. Outcome: The visual designs were approved by the client with high praise, and the project went through development where I oversaw developers to ensure the user experience was what I envisioned. The corporate communications portal is now live on the companies intranet.